We offer a youth group for tweens and teens as part of the religious education program. Our Warriors group is centered around service projects that are created, planned and executed by our young members. Launching this Week: "Show you care, give a pair!" Advent Gift Drive - The Siena House, a shelter for homeless women and their babies. The Warriors executed a complex gift drive for 27 mothers and their babies under three years old. With the help of the Parish community, the Warriors delivered 54 personalized gifts to the shelter in time for Christmas. The Diaper Drive - Simultaneously with the Advent Gift Drive, the Warriors collected 4 truck-loads of baby items such as: diapers, formula, bottles, blankets, strollers, and clothing to serve Siena House’s ongoing list of needs. The Lenten Coat Drive for the Bowery Mission – As part of their Parish outreach, the Warriors gathered over 100 coats for The Bowery Mission, our neighborhood’s organization that serves the homeless community. Click here for website. Housing Works Clothing Donation - Simultaneously with the coat drive, the Warriors sorted and catalogued gently used clothing and donated it on a weekly basis to Housing Works, a NYC based non-profit fighting the twin crises of AIDS and homelessness. Housing Works runs a neighborhood thrift store that resells items to raise money for their cause. The Bake Sale - At the end of the academic year, the Warriors planned, executed and served at their own beautiful bake sale held in the courtyard of 32 Prince St, the building that the St Patrick’s family religious education program calls home. The Warriors raised $1,000 with which they funded their own sports program. The Warriors, following their service time every Sunday, participate in a skills and drills basketball clinic at the St Patrick’s Youth Center. A professional basketball coach works with the kids of our religious education program, teaching them athletic skills, sportsmanship, and team building strategies. The sports program is a fun extension of our faith formation program. The Warriors along with the “Junior Warriors,” are taking an active role in the 12:45pm family mass at The Basilica of St Patrick’s Old Cathedral. Our young people have the responsibility of handing out hymnals before mass, taking the collection, and handing out bulletins and flyers after mass. They look forward to expanding their participation by taking on the role of readers and altar servers. This year, the Bowery Mission amplified their Thanksgiving Meal Program by presenting the most vulnerable and needy in our community with care packages and coats in addition to their Thanksgiving Meals. The Warriors decided to engage our Parish in a coat drive through the month of November to contribute to this ambitious endeavor and successfully adquired many needed items to help the homeless. Coat Drive Website. Based on the success of last year’s liaison with Siena House, the Warriors are excitedly prepared for this year’s Advent Gift/Diaper Drive. The Warriors placed two live Advent Trees in the foyer of our church, decorating them with beautiful, handmade ornaments that they’ve painstakingly inscribed with each mother’s name and baby’s name and size. They welcomed our parishioners to take an ornament after mass and shop for a personalized gift for each resident of Siena House. They kept track of each gift with a detailed spreadsheet to ensure no resident goes without a gift. Additionally, the Warriors worked closely with Sister Mary Doris, who provides them with “an ongoing needs” list outlining the basic supplies for these vulnerable mothers and their babies. The Warriors created more ornaments labeled with each item requested. The generosity of our Parish was overwhelming. 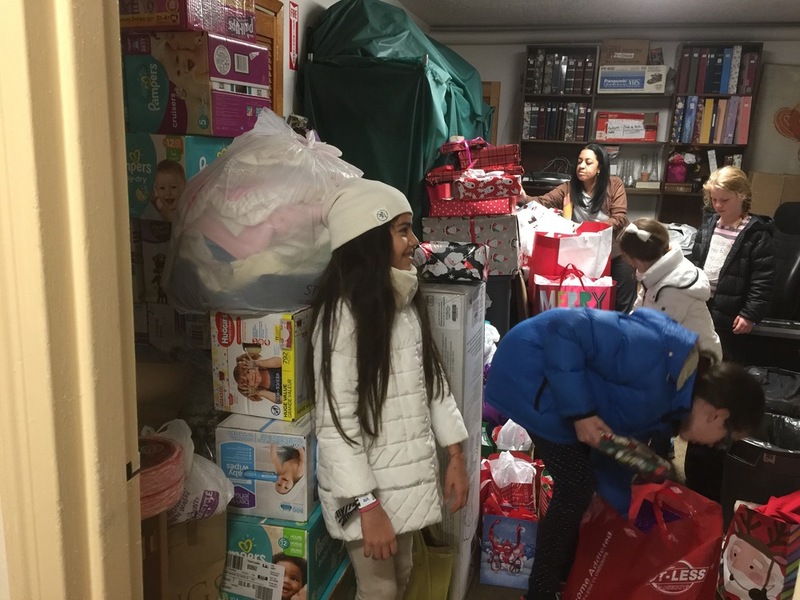 Finally, the children sorted and package all of the gifted items and hand delivered them to Siena House, located in the Bronx. The trips up and down the many stairs into the shelter were well worth the effort, as they got a chance to meet the grateful residents of the Siena House. The Warriors welcome the students in our Confirmation class, the “Junior Warriors,” to participate in service projects to help them fulfill the service hours required by Confirmation. Helping out in the religious education program is another way that the Warriors develop as servant leaders as they put into practice their years of faith formation. “Servant leadership is a leadership philosophy in which the main goal of the leader is to serve.